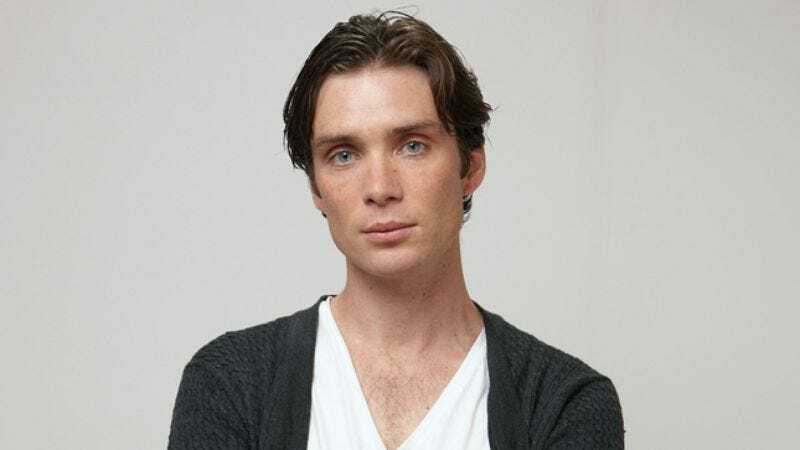 Although he’s done several projects which have banked more than $50 million apiece at the box office, Cillian Murphy doesn’t choose his films by their likelihood of commercial success. For every Inception in his filmography, there are four or five films that come closer to, say, Breakfast On Pluto. And that’s just fine with him. Retreat, Murphy’s latest film, treads slightly closer to commerciality: It’s a thriller set on a small, isolated island where tensions are running high between young couple Murphy and Thandie Newton even before soldier Jamie Bell turns up to tell them that a deadly virus is sweeping the world. It opens on the same day as In Time, a higher-profile science-fiction thriller featuring Murphy as the antagonist, a by-the-book time-cop devoted to perpetuating a viciously oppressive system. Murphy recently spoke with The A.V. Club about the experience of making Retreat, how he goes about picking his projects, how many times he had to watch Inception to really understand it, and what he thinks of Frank Zappa. The A.V. Club: Retreat is effectively a three-hander: Apart from a few scenes with Jimmy Yuill, it’s really just you, Thandie Newton, and Jamie Bell for the duration of the film. Cillian Murphy: That’s it, yeah. AVC: What was it like for the three of you to work in such close quarters? You probably got to know each other pretty well pretty quickly. CM: Yeah, you do. I think that’s why actors are attracted to pieces like these: you’ve nothing really to rely on except for your fellow actors and the dialogue and the camera. It’s all about the performances and the dynamic between these people, so that’s what makes films like this very appealing. We were all kind of drawn into it together. We didn’t have all that much time to hang out beforehand, and we shot it really quickly. So it was kind of getting to know each other as we worked. But everybody was really up for it. We were out in the middle of nowhere, everybody doing it because they loved the material. When you get an atmosphere like that, it’s very conducive to good work. AVC: Not knowing each other seems conducive to that role in particular, given that your character and Newton’s character are already supposed to be somewhat distant. CM: Well, yeah, it certainly was for that relationship. That was kind of what attracted me to the film at the beginning. It’s definitely a genre piece. I know there’s a genre in and of itself—someone mentioned it to me the other day—this locked-in genre, where these people are just trapped in a space. But what I liked was the sort of human element. This is a real couple that’s going through real difficulties and are trying to rekindle something. It’s got a bit more humanity, that setup. AVC: You were working on Retreat with Carl Tibbets, a first-time writer-director. How sharp was his vision for the film? Did he come in knowing exactly what he wanted it to be? CM: I think he did. I think he knew very clearly. The reason films like that can succeed is that necessity becomes the mother of invention. Literally, we were just in this house for that four weeks or whatever it was, and I think between Carl, the cameraman, me, Jimmy, and Thandie, we very much just knocked about every day and figured out how these scenes were going to play. I mean, I think he clearly knew the ins and outs of the script, obviously, and where he needed the reveals to be, and where he needed the tension to mount. But in terms of developing the characters, he was very open to that, which was good. CM: [Laughs.] No. I mean, film is, by its very nature, a collaborative effort, and I think the directors I’ve always been most impressed by are the ones that are most open to any contributions. I think that shows a great level of confidence in one’s self, if you’re able to take other people’s ideas and contributions. And Carl was very much open to that. I think it’s because it comes from his imagination, so he knows it better than anyone else. If a good idea is put forward, then he can run with that. And he was very open. AVC: You’ve definitely built something of a niche for yourself within the thriller genre. Does that surprise you? Were you a genre fan before you started getting cast in such films? CM: Well, I don’t know, I’m kind of… I just seem to follow the good ideas, or try to find the good ideas. I’m always struck by something that appears to be original, because there are only so many stories in this world, and in films, there seem to be even fewer. [Laughs.] In movie scripts, even less. I guess I’m always taken with an original concept, and I really like the idea of this film, the idea of the twists and turns it took. In terms of genre stuff, I don’t know. Sunshine was probably straightforward science fiction. In Time is straightforward science fiction. Inception is something different altogether. It’s never been a conscious thing, but I guess if you look retrospectively, you can see that it’s in the thriller and sci-fi world that I’ve worked a lot. But I’ve also done a lot of standard dramatic fare. I don’t know. You never think in genres. You just think in terms of the scripts and characters. AVC: You got to play two very interesting characters in Peacock, which definitely qualifies as a multi-layered thriller. CM: Yeah, that’s one of those that doesn’t neatly fit into any category, I think. AVC: Which is a good thing as an actor. CM: Oh, well, listen, you know, that’s the other thing you look for: something that’s original and something that will really challenge you. And that one… [Laughs.] Playing two characters is a pretty big one. AVC: When you’re in a film that’s decidedly off the beaten path like that, it’s got to be difficult to pull major distribution. Do you ever think in those terms when you’re selecting projects? CM: I tend to think in terms of the part. My job is to turn up on time and make this character that I’m playing as believable and as honest as possible. All the machinations that happen after the film is shot, that’s kind of beyond my ken. [Laughs.] I really just try and do my job as best I can. I like the idea of the disparity of working on a tiny little film in Wales, and… I’d just come off promoting Inception all over the world. I enjoyed that. But making films affords you the fluidity to go between big, massive productions and small, tiny productions. It’s all about trying to tell an interesting story, really. AVC: You obviously made an impression on Christopher Nolan the first time you worked with him, since he’s continued to invite you back onto his films. Do you happen to know how you first hit his radar? CM: Well, I auditioned for Batman Begins back in the day. If he knew me prior to that… I mean, that was the first time I’d ever met him. I don’t know if he’d ever seen any of my films. That was the first time we got together, though. Obviously, I never felt I was the right material for Bruce Wayne. [Laughs.] But he obviously saw something in me, and we got on. I was a huge fan of his before I’d ever met him, so meeting him was a thrill. AVC: Were you a fan of comic-book films prior to that? CM: No, actually. I’d never read any of the comic books. I mean, I’d seen all of the movies. But I wasn’t aware of the Scarecrow character, for example. Having gotten the part, though, I went back and read them all. But no, I was never a comic-book guy growing up. AVC: Did you know in advance that you’d be invited back for The Dark Knight, or was that off-the-cuff? CM: No, Chris just kind of does his own thing. [Laughs.] It’s always lovely to re-collaborate with someone as lovely in this town as him. But no, we don’t talk about future projects. I mean, he’s got to go in and write these things, and they’re huge films. But it’s always nice to get the call. AVC: Was it mind-blowing to finally see Inception unfold on the big screen, given the unique structure of the filming? AVC: It’s been said that your formative moment as an actor was seeing a stage production of A Clockwork Orange. CM: I guess that was kind of an epiphany, yeah, in terms of what you could do theatrically, outside of the traditional, that you could make a piece of theater that could appeal to a younger audience rather than a traditional theater-going audience. It was an amazing production. AVC: From there, you worked in everything from Shakespeare to Neil LaBute. Never let it be said that you’re inflexible. CM: [Laughs.] Yeah, I never actually went to drama school, so I was very lucky to work with great directors on great material on the stage in England and Ireland. It’s a brilliant place to learn fast, you know? AVC: There must have been a significant learning curve. Was there ever a point when you considered that maybe you weren’t in your element? CM: Yeah. Always. [Laughs.] I think that’s part of it when you’re an actor. There’s always a level where you think you can improve and do better. Certainly at the beginning… You know, I did four years of straight theater without ever having a part in a movie, and I remember being far more nervous on a film set than I was on the stage. It took a while for that to become less so. AVC: Many of these questions were written while listening to Frank Zappa’s “Son Of Mr. Green Genes,” which inspired the name of the band you and your brother Páidi had in the late 1990s (The Sons Of Mr. Greengenes). Which Zappa album was your gateway drug to his music? CM: [Laughs.] It was Hot Rats. I think a lot of Zappa purists would say that’s the most accessible of his albums. But it kind of allows you to listen to him. If you can get into Hot Rats, then maybe you can ease your way into Weasels Ripped My Flesh or whatever. [Laughs.] But I loved his individuality and his sophistication. He was a pure genius, one of a kind. He really didn’t run with the crowd. He did his own thing. And I admire that in any artist in any forum. It’s always very inspiring. It should keep you hungry. He didn’t make the easy decisions, ever. I admire his music and what he represented. AVC: In the early 1990s, The Sons Of Mr. Greengenes was offered a five-album deal with Acid Jazz Records that you ultimately didn’t accept. Do you have any regrets about not pursuing a music career? CM: No, but I’m definitely a frustrated musician, though it’s more in terms of wishing I was a better guitar player and songwriter. [Laughs.] But I’ve never regretted becoming an actor instead. I think it’s been a more pure form of self-expression for me. I luckily found something that I could aspire to be good at, whereas I never… I think I’d never quite reach that level of artist that I enjoy in the music world. So no, I don’t regret that. I mean, I still play for fun, and I spend all my time going to gigs and buying music. So it’s worked out good in the end, I think. AVC: Plus, you’ve gotten to sing in various films. Is that you singing and playing Eagles Of Death Metal’s “Speaking In Tongues” in Watching The Detectives? AVC: You did, however, get to sing in Disco Pigs. CM: Yeah, I’ve done a bit. I did a bit in Breakfast On Pluto, a bit in Disco Pigs… Yeah, any chance I get. I’d love to do a musical. I don’t really like musicals, per se, but sort of a non-traditional musical? I’d love to get a chance to do that. AVC: Relatively few actors can say that they found their breakthrough role in a zombie movie. Did you have any hesitation about taking on 28 Days Later? CM: Well, at that point, I’d done small little Irish films, but nobody had seen those, so it was huge to be able to work with somebody like Danny Boyle. I mean, even before the Oscars, before all of the success he’s had since, Trainspotting was just sort of burned into my consciousness as a teenager growing up. And also Shallow Grave. So the chance to work with him in a leading role was just a dream. And again, I didn’t think beyond that. It was really just the chance to make a film with Danny Boyle. That’s it. AVC: In 2009, you worked with Brendan Gleeson in the film Perrier’s Bounty. You’d worked with in your first film, Sweety Barrett, back in 1998. Did you get to know him at all at that time? CM: Oh, yeah. I’ve made, like, five films with Brendan now. He was also in Breakfast On Pluto. I just adore Brendan. There’s nothing he can’t do as an actor. Also, right from Sweety Barrett, he’s been unbelievably kind to me and given me great advice, and has become a friend. He’s someone whose career path I admire, just in terms of doing everything as an actor. I really feel actors should try and do as much diverse work as possible to try and keep it interesting. Brendan has managed to do that. AVC: Given the diversity of your filmography, do you have a favorite project you’ve worked on over the years that didn’t get the love you thought it deserved? CM: Oh, I’m kind of loath to pick one project over another or whatever. You go into every film sort of thinking it’ll be your best work, and that’s necessary. I think in this business, you really have to be forward-looking the whole time. I think nostalgia is sort of the death knell for any artist. [Laughs.] So I just keep looking forward to the next project. You’ve got to keep a hunger to improve and to challenge yourself.